Intermec Inc., provider of inventory tracking and supply chain solutions, announced integrated passive ultra-high frequency (UHF) RFID capabilities for its ultra-rugged CK70, CN70 and CN70e mobile computers. Part of Intermec’s leading 70 Series family, these devices now offer an integrated RFID reader with no external antenna, adding RFID reading capabilities for improved data collection and read performance. The Intermec 70 Series RFID reader platform supports medium to long-range read distances and is optimized to read one or many tags in support of inventory and asset tracking applications in retail, health care, industrial and government market segments. 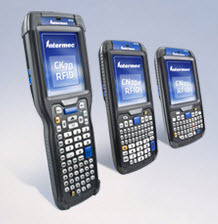 With a fully integrated design utilizing Intermec’s IM11 embedded module, along with an internally housed antenna, customers can experience advanced RFID read performance while maintaining the already-compact form factor of the 70 Series mobile computers. Additionally, the 70 Series RFID is fully compatible with the entire suite of original 70 Series accessories including the FlexDock modular docking system, which is designed to meet current and future charging and communication needs while maximizing the return on accessory investment.